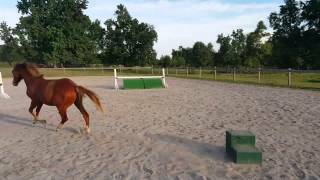 Paschal is a wonderful young chestnut "roany" rabicano gelding who exhibits 3 solid gaits with nice long strides and uphill movement. This brave guy is very confident and has even jumped the jumps in my arena completely on his own, just for fun! He is well-handled, well traveled gelding who is confident and ready to go to his new home. He leads at both walk and trot and would require very little prep work on your part to show on the line! This young gelding also bathes (with soapy sponge and hose nozzle), loads (and travels fabulously), does well socially in a herd and is getting familiar with clippers. He is extremely easy-going and has wonderful ground manners for the vet, farrier and grooming.